Juvederm and Restylane are two of the most popular dermal filler brands, used by dermatologists and plastic surgeons around the world. When choosing a dermal filler, there are many factors to consider: how long it lasts, what type of material it is made of, how smooth is it, its filling ability, if it includes an anesthetic, how much it costs, and so much more. Some fillers even offer special ergonomic syringes and injector devices to make them more comfortable to use. With all the different dermal fillers to choose from, it can be overwhelming. Although it ultimately comes down to personal preference, Juvederm and Restylane do have some differences that might help you decide which dermal filler is right for you and your patients. Restylane dermal fillers are made of non-animal hyaluronic acid (NASHA) gel. This dermal filler brand is available as regular Restylane, Restylane Lyft with thicker particles more suitable for volume-filling, products meant especially for the lips, and a variety of Skinboosters to help rehydrate and rejuvenate skin. The Skinboosters are a little different, requiring multiple treatments to maintain results, but most of the other Restylane injectables last about six months to a year after one treatment. Some research has suggested results can even last up to eighteen months. Do these dermal fillers contain an anesthetic? 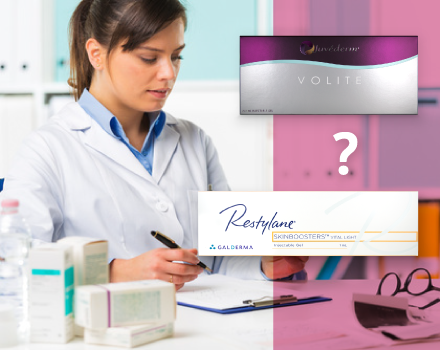 Some Restylane products are available with or without an anesthetic, Lidocaine, while some are only available with Lidocaine included. This could be an advantage since some patients are unable to use fillers containing an anesthetic. What is its filling ability? Each Restylane product has a different filling ability, ranging from Skinboosters to add hydration and Restylane for nasolabial folds and moderate wrinkles up to Lyft to restore lost volume. The gel has a slightly granular consistency versus Juvederm. 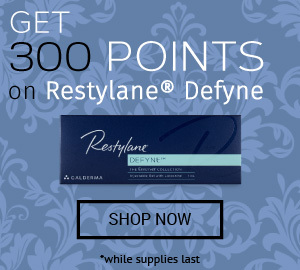 Is there anything else to know about Restylane? Some Restylane products, formerly called Emervel, are made with a thorough purification process. This purification removes excess bacterial proteins which might otherwise cause a reaction. This may reduce the chance of patients experiencing skin irritation, an advantage for sensitive skin. Juvederm dermal fillers are made of non-animal, cross-linked hyaluronic acid gel, similar to Restylane. This dermal filler brand is available in Juvederm 2, 3, and 4, for correcting moderate wrinkles up to restoring lost volume. The brand also has Hydrate and Volite for hydration and fine lines, Voluma and Volift for volume restoration, and Ultra Smile or Volbella for lip augmentation. Most of the dermal fillers in this brand last between six months to a year, with some lasting up to eighteen months. The one hydrating injectable, Volite, has results that last about six to nine months. What sets this mesotherapy injectable apart from most other brands is that the long-lasting hydration comes from just one injection. Most other brands, including Restylane, require a series of injections at first to restore hydration to skin. Almost all Juvederm injectables contain the anesthetic Lidocaine. Although this is great for pain relief, it does not leave any options for patients who are allergic to the anesthetic or who cannot have the anesthetic for other medical reasons. Each Juvederm product has a different filling ability, ranging from restoring hydration and filling fine lines to correcting moderate wrinkles and nasolabial folds up to volume restoration. The product range is similar to what Restylane offers. Juvederm fillers are created using special Vycross technology to produce a smooth and soft gel for natural-looking results. Is there anything else to know about Juvederm? There are concerns that Juvederm may not be suitable in the under-eye area, since it attracts too much water, swelling too much in the area and causing the Tyndall effect, which is a bluish discoloration. In this one particular region of the face, Restylane is more suitable. Both fillers are made of similar ingredients and come in a variety of products to correct fine lines, moderate wrinkles, deeper wrinkles, or volume loss, along with lip fillers and hydrating injectables. They last a similar amount of time, although this varies from product to product, but Juvederm Volite in particular requires fewer initial treatments to hydrate skin than the Restylane Skinboosters. Although some Restylane products are available with or without Lidocaine, almost all Juvederm fillers contain Lidocaine, which could be a problem for some patients who cannot have anesthetic. Some Restylane Skinboosters have the advantage of a comfortable injector which pre-measures hyaluronic acid gel, making treatments quicker and easier for the one administering the injections. Restylane has been around longer, but Juvederm has also been available for many years, both proving their safety in countless procedures. The two fillers have different consistencies, with Restylane's granular formula possibly more suitable for filling deeper wrinkles and Juvederm's smoother formula more suitable for treating wider areas since it may spread more. Ultimately, each brand of filler has its own advantages, and may be more suitable for one application versus another. In many cases, it may be just a matter of personal preference which filler to choose. To view the range of Juvederm and Restylane products available, to compare prices, or to purchase these fillers for your medical practice, visit DoctorMedica.co today.